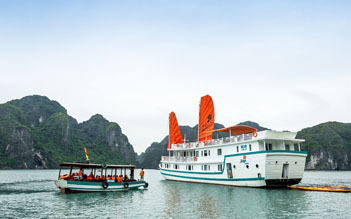 With L’Azalée Premuim Cruise, you will enjoy the peace and tranquility of cruising between the awe-inspring limestone formations and experiencing firsthand the local culture within the traditional floating villages. 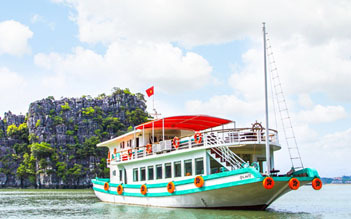 Your are amongst the islands, bays and beaches of Halong Bay - a UNESCO World Heritage-listed destination. Sunrise For early risers you can take in a morning Sunrise over Bai Tu Long Bay and watch the sun rise over the lime stone karsts of Ha Long. Sunrise For early risers you can take in a second morning Sunrise over Bai Tu Long Bay and watch the sunrise over the lime stone karsts of Ha Long. We have just finished a 3 day, 2 night cruise. I feel so relaxed after spending this time in Halong Bay after a busy few days in Hanoi, Phu Quoc and HCMC. The rooms are excellent - very clean and comfortable and large beds. The staff are brilliant - very friendly, polite and helpful. We visited some caves, went kayaking, and sunbathed on deck. On the last day, we climbed TiTop Mountain for some great views. Many of the stops are very busy with tourists from other boat trips. On the second day, there were fewer tourists at the places we visited as we had gone further into the bay (having transferred to a day boat). I would have liked to have visited another high mountain viewing point which was more off the beaten track with few tourists. The food on board is in abundance - each meal is multiple courses. The drinks are quite expensive on board but I suppose it is the same on all cruises. You get 2 free water bottles per room per day. The transfer bus to Hanoi offered is comfortable and has wifi. Amazing Cruise To say the food was outstanding is an understatement. The staff & facilities were great! 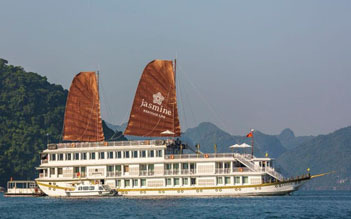 Visiting Ha Long Bay is a must, I would reccomend L’Azalee Cruises to everyone! We were traveling as a family (four) with L'Azalee. 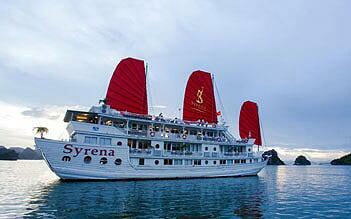 Very nice boat, spacious rooms, good beds, good food and very courteous staff. A number of activities were offered: Caving; Kayaking, squid fishing and visiting the (overcrowded) Titop Island with great views. We had bad luck with the weather (for which the boat operators are of course not responsible) and of course the Halong Bay is overrun. She is still impressively beautiful. Overall, we highly recommend L'Azalee. Two minor criticisms: the check-in took a bit long and the drink prices on board have European, not Vietnamese level. Everything from the service to the tour guide very nice. 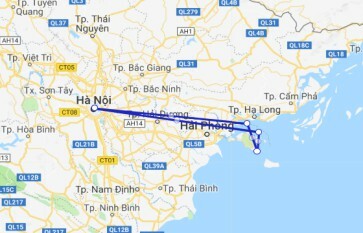 My partner and i did one day trip on Ha long bay. Just start from Hanoi to Ha long bay by bus. We had great time in Ha long bay. The program was nice with most the time you can enjoy scenery and had lunch on boat. Our host took us visited to the cave and then slowdown cruise back to marina .Very enjoyed with service and Lazalee team. Highlight recommend for this company !